Poulnabrone dolmen is located in the Burren in County Clare and is one of the finest dolmens (single-chamber megalithic tomb) found in Ireland dating from the Neolithic period, approx built in 3200BC. Poulnabrone means ‘The hole of the sorrows and consists of upright stones supporting a large capstone. How we see the Poulnabrone dolmen today would have been very different to how it looked during Neolithic times when it was covered in earth to form a barrow. Excavations of the site during the 1980’s produced amazing evidence of ancients burials with the discovery of 21 people and animals buried under the dolmen. Other items found buried alongside the people consisted of a polished stone axe, a bone pendant, quartz crystals, weapons and pottery. 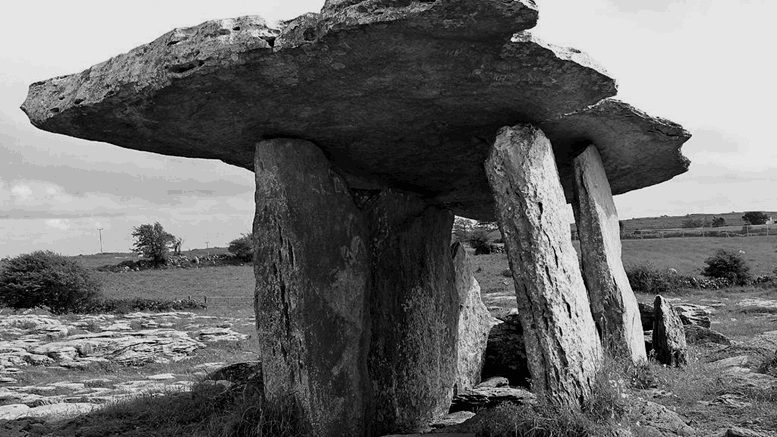 This remarkable photo is how Poulnabrone dolmen looks today, very different to what it once was. Although we only get to see the shell of the megalithic tomb we are giving a clue on how important burials must have been for the Neolithic people. So who would have been buried at Poulnabrone Dolmen? Considering the sheer size of the stones erected in the construction of the tomb this site held some importance to either a large family or a small community in the area. Although we have no documented records of who exactly built this site or who was buried underneath it was most likely kept for those of the highest rank in society and their families. The remains of a child buried outside the chamber dated to the Early Bronze Age telling us the monument held importance for many years after it was built. In all there are 163 portal tombs in Ireland with the majority of them located in the northern areas of the island. Most tombs had their entrance face the east towards the sunrise but this was not the case for all tombs. Another famous site is at Brownshill, Co.Carlow with a 100 ton capstone. Other examples include Kilmogue, Co. Kilkenny and Knockeen, Co. Waterford and of course the passage tomb at Newgrange. Ancient local folklore tells a story that Dolmens were once called Leaba Diarmaid agus Grainne, “the bed of Dermot and Grainne” from the well known legend of the elopement of Dermot with the wife of Fionn MacCuil. It was said that Dermot erected one every night for the couple to sleep in while on the run.